The scientists at the IU School of Medicine-Bloomington nicknamed their new microscope the “OMG” for good reason—the images it produces are showstoppers. The DeltaVision OMX imaging system (its official title) is a $1.2 million dollar microscope that can peek inside a cell and image fluorescent proteins in unprecedented detail. Jane Stout, a researcher in the NIH-funded lab, used the OMG to create this spectacular image that won her first place in the high- and super-resolution microscopy category of the 2012 GE Healthcare Life Sciences Cell Imaging Competition. What you’re looking at is a cell in the midst of dividing into two identical copies—a process called mitosis. Here, the chromosomes (in blue) are aligned at the cell’s equator. Microtubules (red) from opposite poles of the cell attach to the chromosomes using the kinetochores (green) and pull them to opposite ends of the cell, which then splits in half. But sometimes cells do not divide properly—a common problem in cancer. Understanding the mechanics of cell division could help us correct this process when it goes wrong. 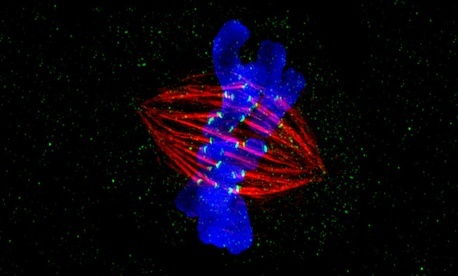 Jane Stout’s prize: her mitosis image will light up a billboard in Times Square in New York City in April. That is a wonderful celebration of science! Next Post | With GSA Canceling Trainings, How Can Feds Develop New Skills?